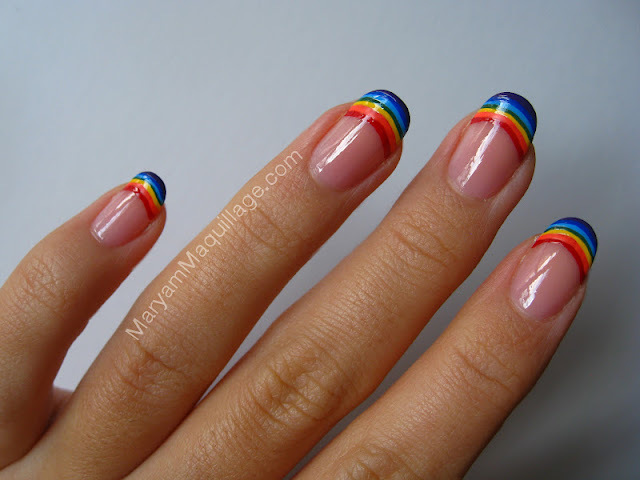 Rainbow arches look better on oval nail shapes, so round out those square tips to create arched nail beds for a matching canvas. Given that this nail design is meant for longer nails, make sure to leave at least 1 mm of space for each color that you use for the arches. 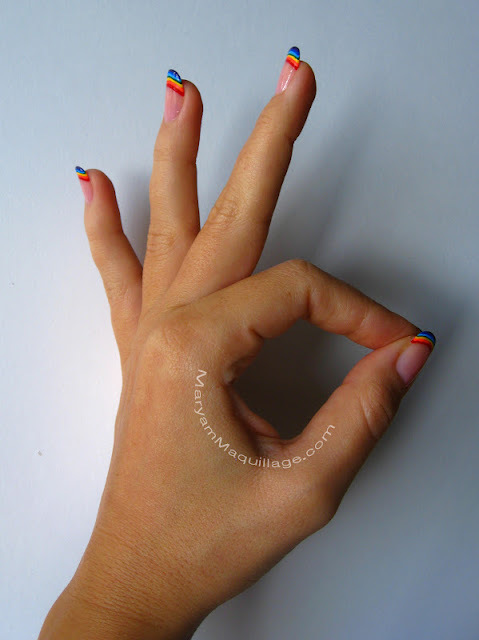 I used 7 colors and started the rainbow tip 2 mm below my tip root, hence, my nails are 5 mm long. Use better quality nail polishes to ensure opaque coverage. You only want to have one layer of each color. The Soo Nails polishes tend to be very opaque and super affordable, so this is my #1 brand for nail art. I usually get these at any local beauty supply store in the NY/NJ area. Happy Rainbows make the day A-OKAY!!! Looking at your nails make me Happy! i wish i had steady hands. oh so pretty , just lookin' at them made me happy ! Your nails are so pretty! I love the look! WOW Very Cool I Love Them So Cute !!! So perfect and bright and happy! Super cute and cheery! I wish I could let my nails grow, I'm so impatient lol. Beautiful creation you have here Maryam. woow Lovely! I have never seen nails like this :o). It's so original! Xoxo V.V. French tips are always so difficult to do, but yours is absolutely perfect! 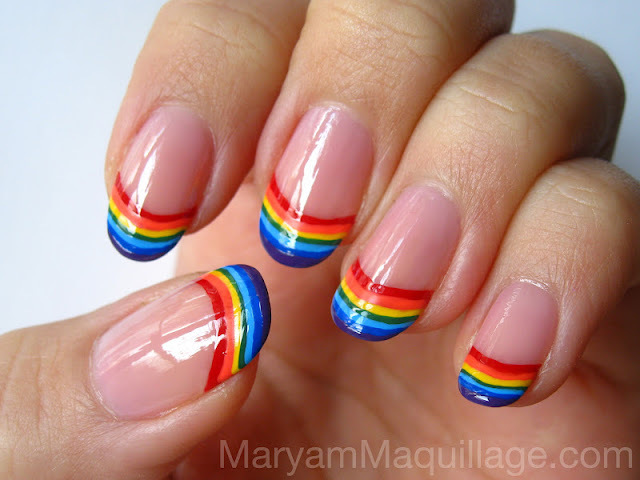 :D I Love your rainbow nails! OMG! !..Colorful french tips!..I love it hun..Very fun manicure..Can't wait to see more from you..^_^..
Wow you keep getting better and better by the day your talent is amazing honey!! Love the colors on your nails they go with everything! What kind of camera do you use to take your pictures honey if you dont mind me asking? This mani looks amazing! Love it! Love this creation! I wish I had longer nails to do that with. This is such a fun mani! Happy and bright which is perfect for this time of year! Sooo cute and they look simple but im sure it would take me at least an hour to tackle with my shakey hands!! lol.. very cute though! i cant believe you can do this on your own nails! thank you sooooo much everyone!! OMG, I am always amazed at your steady hand! Your nails are all perfectly done! Wowwww!!!!! I know this post is old but these are amazing!!!!!!! So cool and so crazily skilled!!! !